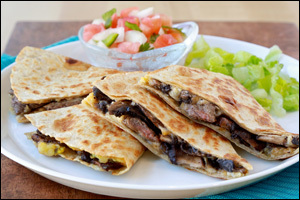 How did we make over a twice-stuffed beef quesadilla and keep it guilt-free? By combining lean steak with one of our favorite meat swaps -- portabella mushroom strips! In a small bowl, combine shredded cheese, cheese wedge, and jalapeños. Stir until uniform. Halve portabella slices widthwise. Bring a large skillet sprayed with nonstick spray to medium-high heat. Add portabella pieces, and cook and stir until softened and lightly browned, about 4 minutes. Add sliced steak, sprinkle with seasonings, and cook and stir for about 2 minutes, until just cooked through. 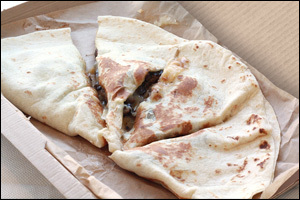 Lay tortilla flat and spread with cheese mixture. Evenly top one half with cooked steak and mushroom slices. If needed, clean skillet. Re-spray and bring to medium heat. Place the loaded tortilla flat in the skillet, and cook for 2 minutes. Using a spatula, fold the cheese-only half of the tortilla over the filling, and press lightly to seal. Carefully flip and cook until crispy, about 2 minutes. Slice into wedges, and enjoy! Have leftover steak? Click for more guilt-free recipes, courtesy of HG! They've Made a Huge Mis-steak. Emphasis on the word "huge." The tortilla used for this quesadilla could double as a decent-sized hat... That's how big it is! And when such a massive tortilla is filled with loads of cheese and a double helping of steak, it's not exactly surprising that a serious calorie situation emerges. We're talking nearly a THOUSAND calories. The kooky quesadilla also comes with a side of chips... REALLY!? So not necessary. For our swap, we started with a high-fiber tortilla that has a respectable calorie count, and filled it with light cheeses, lean steak, and (super-sizer alert!) meaty portabella mushroom strips. The result is a mega-sized quesadilla without a mega-sized calorie count. So if you crave a beefy quesadilla, whip up our recipe. As for T. Bell, check out our Taco Bell Survival Guide for smart picks (and more skips)! Your Taco Bell-loving pals could certainly use today's recipe... Click "Send to a Friend" to make their day! November 12th (a.k.a. today) is National Pizza with the Works (Except Anchovies) Day. Why so judgy on anchovies, food-holiday peeps? They're pretty healthy and flavorful too! Click here for our best pizza picks and recipes... and feel free to add anchovies.